I am scouting for good news forever! I do keep my eyes on real news, bad news, quickly keep the necessary, take a deep breath and then move to finding good news yet again! And then I found Jayanthi Sampathkumar!!! She’s been on my mind for a while. Just like Anuradha Dutt was when I saw a pic of her running in a sports bra and shorts – and I featured her on my blog! I salute women who break real stereotypes and not just for social media pictures – but those who break mental barriers for all of us, keep pushing the boundaries of what is and what should be. Back to Jayanthi! Everybody already knows her. She is the woman who ran a Full Marathon in a Sari under 5 hours at the Airtel Hyderabad Marathon (AHM) this year. Rightfully so, a feat! I wanted to feature her on my blog but it was after getting in touch with her I realized, she already has a blogspot of her own. But unlike me who promotes her writings in various forums pan India and outside, Jayanthi sticks to blogging for herself. She does share her blogs on her Facebook page, but there is a large number of runners, non-runners out there who have not dug deep into Jayanthi’s beautifully thought, tirelessly trained for and perfectly executed effort of running a Full Marathon in a Sari! So I asked Jayanthi if I could ransack her blogs and pick things interesting enough to be listed to create more awareness about her Sari Adventure which today has found its deserved space in Guinness Book of World Records! It was while Jayanthi was preparing for a FM, she came across an article of a man having run a FM in a Business Suit. And so she researched if anyone had ever run in a sari before. To her surprise the slate was clean and it was then she decided to give this a shot! She searched Guinness World Records and was happy to note that they had a category called “fastest marathon dressed in a sari” for which no record had been created. That’s how it all started for her. The purpose behind Jayanthi’s Sari Run was to support handlooms and empower women to stay physically fit even if they wear only saris. Jayanthi suffered from recurring IT Band pain and a weak achilles tendon. Time and again while on her long runs on the weekends, she was left in a lot of pain. This is when she decided to experiment with barefoot running! The footwear – It was interesting that after having experimented with 6 shoe models and sizes (each one working to a varying degree) the sandals felt right. She said the sandals weren’t as fast as the shoes but could run for longer and no injuries came back. It was then she decided to continue her training in Luna Sandals. She finally ran AHM with these running sandals. Jayanthi had to practice and figure out how to use a rest room while in the middle of the run and tie the sari back in the position! To me – this is where it breaks my thought process. I can imagine myself running in a sari ( a half maybe), but using the porta-potty in a sari??? It was a huge task for Jayanthi to figure out how to tie the sari. She admits to having sleepless nights thinking of the sari length – about how much sari to pull through, where to put the safety pins, how much to leave for the second loop. The blog on this one is one of my favorite blogs on her Running in a Sari Adventure. Super interesting is this – Jayanthi does not want to support plastic packaging. The eco-friendly alternative was to prepare her own energy gel – Which she did along with her coach – Dr. Vignan. (btw – every blog of Jayanthi talks about the effort her coach Vignan had put in along with her). Jayanthi is a vegan- so her source of energy while on the run had to come for vegan alternatives. She used four simple ingredients – dates, palm sugar, salt and lemon juice to create her own energy gels. On the race day – Jayanthi admits that she was tired even before she ran half the FM distance and at the 39th km, she was in severe pain. Teary eyed, she wanted to quit. But she remembered passing by her very proud mother at the 33rd km mark. It was the look of joy on her mother’s face that made her finish the distance! A week before the AHM, Jayanthi was hugely consumed with worry. She writes how the thought of not being able to finish under 5 hours was making her doubt her entire effort and consumed her. That’s where a beautiful tip from her friend at work – Janardhan, helped her – The mind consumes more energy than the body. If you calm it, you will be able to use all that energy for your run – a tip that most of us can use! 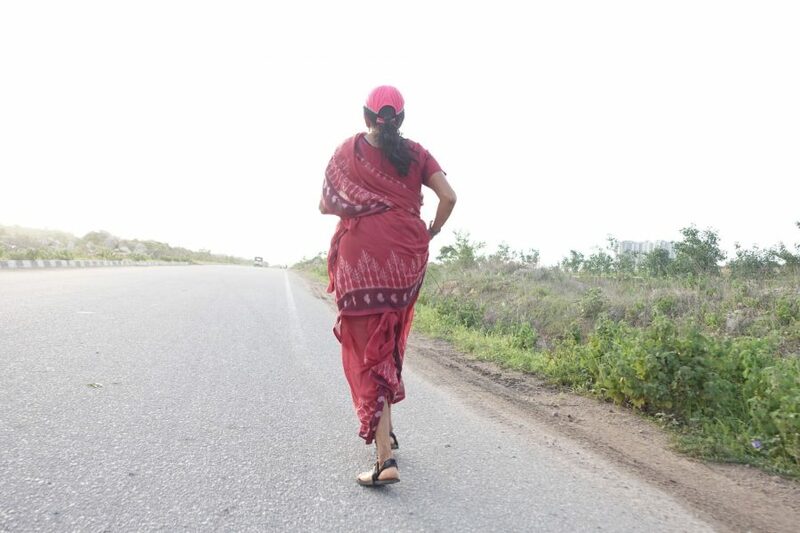 All of Jayanthi’s blogs on her Runing in a Saree adventure are worth a read. Each one of them tell us how much planning and effort went out to make this a success. She had a team of believers, supporters and her family stood behind her through it all. It really isn’t a óne fine day’ unreal story. Am putting the links to Jayanthi’s blogs here for you all. Running a marathon in a Sari – 1 – Why Sari? Running a marathon in a Sari – 4 – Can I do it?